8th Day Comes to Philly! 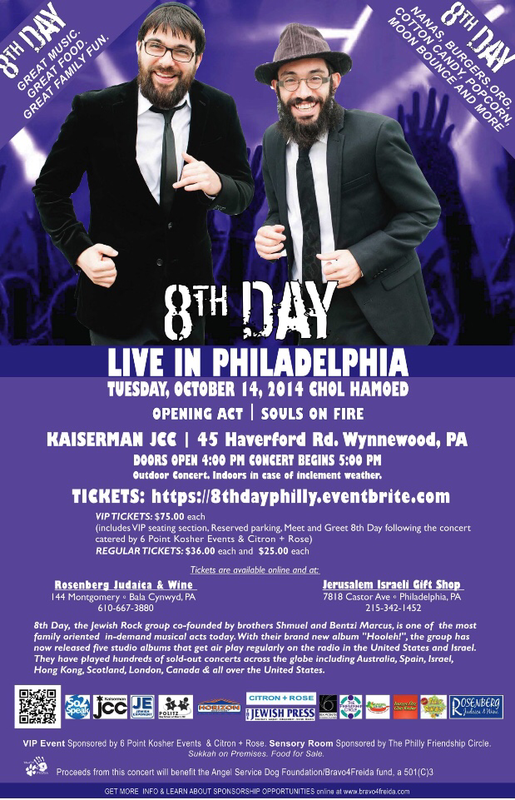 This Chol Hamoed Sukkos the music duo of brothers Bentzi and Shmuel Marcus, aka 8th Day, are bringing their signature act to Philadelphia, PA. Fans can expect a full feature show where the band will play all their current hits, the 8th Day classics and some surprises mixed in. “This will be a chance for us to celebrate with the Philadelphia community”, says Shmuel, “we’ve planned something very special for the occasion”. The grounds crew and concert producers have been carefully planning a beautiful setting with great sound and lighting effects to create an amazing concert environment. The show will take place at The Kaiserman JCC on Tuesday October 14th. The doors open at 4pm with food and drink vendors available, and plenty of activities for children. The concert will start at 5pm with opening act Souls On Fire and then 8th Day’s set to follow. Proceeds of the concert will help raise funds for the Bravo4Freida campaign, an endeavor to help a young girl overcome the challenges of Idiopathic Anaphylaxis, an extreme allergy condition that is very dangerous. “We are so happy to be joining in with Philly on this one” Bentzi added, “it’s going to be a great show for a great cause G-d willing”.